SQL CLR Trigger, How to make an assembly trusted due to transparent code call critical code? The accepted answer is correct, but there is some additional information (too long for a comment) that I would like to add. When I attempt to post my answer I get the error message "An error occurred submitting the answer." This has been occurring for two days now, so I assume there is some content in my answer that is causing the error. I can't post the content of my answer here (when I do I see the error message, "an error occurred submitting the question"). 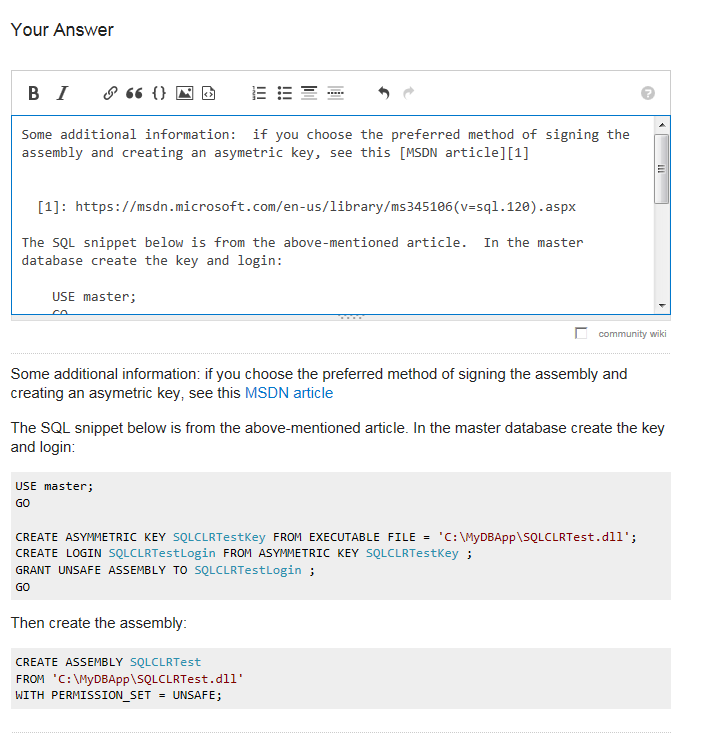 The answer contains a link to an MSDN article and some SQL code snippets, nothing out of the ordinary. Is there any means to discover why my answer will not post? This typically happens when there's an error like that, it means there's a firewall or overzealous protection software that's getting in the way and interpreting that post's text as malicious code. You can check if that's the case by changing the URL from http://stackoverflow.com to https://stackoverflow.com. While we don't officially and fully support HTTPS yet, posting works fine. Traffic-scanning software can't see the actual contents, so if it is to blame, the post should go through just fine that way. How can I ask a question with code involving SQL injection? Unspecified error when submitting posts to Stack Overflow? Submitting error - copy to the rescue? Why am I getting “an error occurred submitting the question” when posting a question? Why say “Stack Overflow is not a crowd-sourced debugging framework” when asked to reason a script behavour?